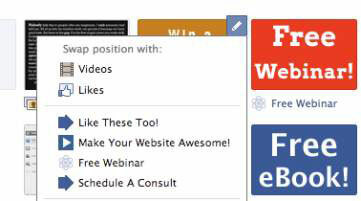 You can edit the application tabs on your Facebook Page in several ways. You can change the tab names, change the tab images, delete tabs, and change the order of your tabs. You can only change the names of third-party tabs, not the standard Facebook Page applications like Photos, Videos, and Events. On your Page, click the down arrow to the right of your tabs. This puts your views and tabs in edit mode. Click the pencil icon at the top right for the tab you’d like to edit. Enter the desired name in the Custom Tab Name field. Click Save, and then Okay to close the window. You can only change the icons of third-party tabs, not the standard Facebook Page applications like Photos, Videos, and Events. Click the Changelink, Custom Tab Image. A new browser tab opens, prompting you to upload an image. The tab image dimensions are 111 pixels wide by 74 pixels tall. After you upload the new image, close the browser tab and click Okay in the pop-up window mentioned in Step 3. Click the tab you’d like to swap positions with. Note that you can’t change the position of the Photos tab. On your Page admin panel, click the Edit Page drop-down menu and click the Manage Permissions link. On the next page that appears, click the Apps tab on the left. In the Added Apps section on the right, find the application you want to delete and then click the X button to the right of the app. Facebook displays a dialog box asking whether you’re sure you want to remove the app. Click the Remove button in the bottom of the pop-up window to delete the app. 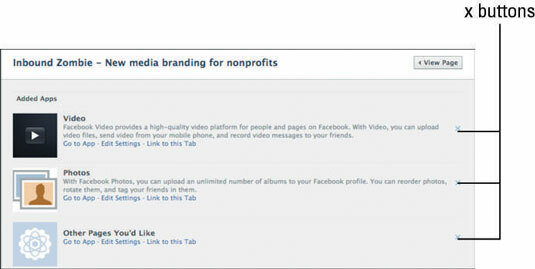 You can’t remove some Facebook apps, such as Video, Notes, or Photos, from your Page. These core apps are instrumental to the Facebook experience, and Facebook developed them internally.